The YSP Café at the Kennel Block at Yorkshire Sculpture Park01924 832631work CafeThe Kennel Block is an historic building sympathetically restored in 2011 to include a learning centre and cafe. 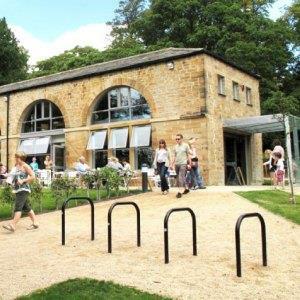 The YSP Cafe offers light bites and refreshments and has a generous outdoor seating area overlooking Yorkshire Sculpture Park and Bretton Hall. The Cafe is open every day and there is no need to book. The Kennel Block is an historic building sympathetically restored in 2011 to include a learning centre and cafe.